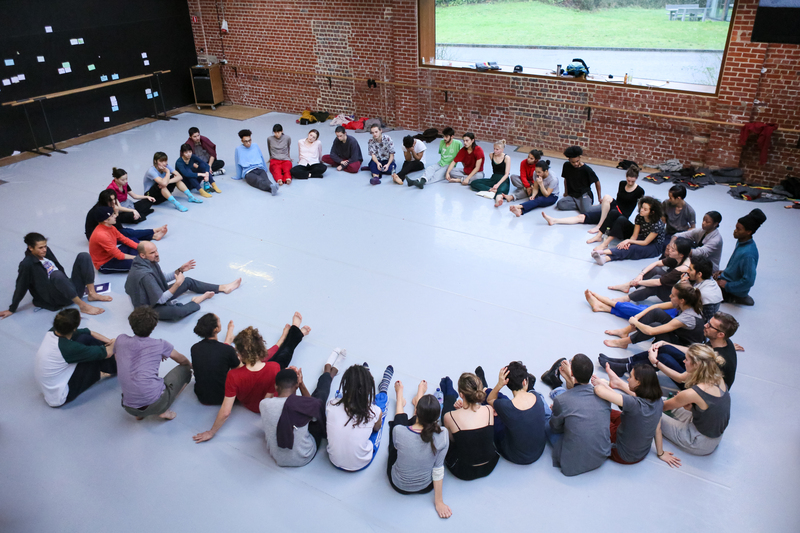 The basic cycle 'Training' aims to help the student gain insight in the technical foundations of contemporary dance and the specific P.A.R.T.S. approach, characterised by the combination of ballet and release technique, a focus on physical awareness, theatre and musical abilities, creative development and theoretical reflection. The Training Cycle is aimed at students aged between 18 and 23, who want to become a professional dancer and/or choreographer. The school aims to strengthen and enrich their dance skills in the broadest sense, to expose them to professional working practice under the guidance of experienced artists and teachers, and to support and nurture their creative voices. Key considerations are to teach and encourage students to think, to research, and to communicate; and to develop an open mind and a caring attitude. The Training Cycle does not offer separate sub-programs for dancers and choreographers. Both ‘technical information’ and ‘conceptual content’ (if one can make such general distinctions) are important for future dancers and choreographers alike, and it is up to the student, with the school’s help, to work out an individual pathway that is tailor-made to reflect both their current needs and their longer-term goals. A P.A.R.T.S. graduate can go on to be either a dancer, a choreographer or a dance maker. They may end up in a company, in a temporary project, or working alone. They may be in permanent employment, or be a nomadic freelancer. But whatever path they decide to take, they will need a clear personal profile, based on professional knowledge and skills, as well as on the choices that they make from a wealth of opportunities. For a very large part of the programme, all students follow the same trajectory (often different teachers work in parallel groups on the same topics). At the end of the 2nd year and in the 3rd year, some periods offer divergent parallel options, allowing students to choose what suits their interests and development best. Since all teachers at P.A.R.T.S. are guest teachers, their teaching takes place in blocks of 2-8 weeks, 4 or 5 sessions per week. The updated study guide with the programme of 2019-22 will be available from January 2019 onwards. In the meantime, you can still download the study guide 2016-2019 here to have a general idea. General note: the text below is a general description of the principles of the curriculum of the Training Cycle 2016-2019. It will be updated by January 2019.